Heading into Nebraska’s game at Illinois last week, Tim Miles talked about a few things the Huskers needed to do to get back on track. Unfortunately, the Huskers did not accomplish most of the things he talked about (like getting Glynn Watson Jr. going offensively). The one they did, however, is keeping senior center Tanner Borchardt on the court. 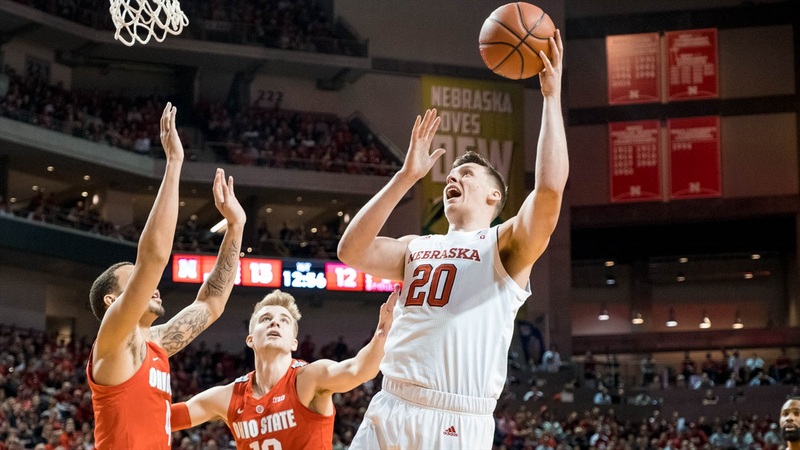 After playing just 15 minutes before fouling out in his first post-Isaac Copeland Jr. injury start, Borchardt played a career-high 32 minutes including 19 in the second half in Nebraska’s 71-64 loss at Illinois on Saturday. Borchardt was a minus-1 in the seven-point loss, and he spent nearly half his court time with the starting lineup including starting guards Glynn Watson Jr. and Thomas Allen Jr. who were minus-15 and minus-12, respectively. Borchardt put up his first career double-double with 12 points on 6-of-9 shooting with 18 rebounds (11 offensive), one assist, one steal and just three fouls. Borchardt had been averaging over seven fouls per 40 minutes on the season, so him staying out of foul trouble was a great sign for the Huskers. He didn’t pick up his second foul until the 12-minute mark of the second half. Two of his fouls were playing one-on-one defense in the post and apparently dropping his arms (I didn’t love either call, personally) while the third happened in a pick-and-roll situation where he was slow to recover after showing and intentionally fouled from behind to stop the bucket on the slip (his man split the free-throws). Overall, however, Borchardt did well in the post. Illinois’ two centers shot 2-of-4 with one foul drawn and one offensive foul against the 6-foot-8, 250-pound former walk-on. Nebraska played drop coverage against a lot of pick-and-rolls with Borchardt hanging back instead of hedging on the screens, and he was able to make a couple of plays on the ball, whether it be challenging shots from the guard or stealing a pass to the big. Offensively, Borchardt is strictly an advantage scorer, which means he’s never going to score one-on-one without someone creating a look for him. You’re not going to enter the ball to him in the post and let him go to work, but that’s OK. Borchardt earned all 12 of his career-high point total through hard work. Two of his buckets came on put-backs, two came on dump offs to Borchardt in the right spot in the halfcourt (including one really impressive finish where he rolled down the lane, caught the ball, left his feet and avoided a defender trying to take a charge before finishing), one dump off in transition and one pick-and-roll finish. I actually thought the guards missed Borchardt inside with good position a number of times throughout the game (James Palmer Jr. found him twice and reserve Thorir Thorbjarnarson, arguably the best passer on the team, found him for the other two assisted buckets while playing just 17 minutes). But the story of the game was Borchardt’s rebounding. He was officially credited for 18 rebounds, but upon re-watching the game I noticed he should have had 19 as one of his defensive boards was credited to Isaiah Roby for some reason. The secret to Borchardt’s rebounding was positioning. He got inside position on both ends of the floor on nearly every possession, and he had a chance to grab even more boards had he gotten a couple more bounces to go his way or had Nebraska missed another couple of shots. Tanner Borchardt was Nebraska’s best player on Saturday. The Huskers are not going to win any more games if that continues to be the case, but even so his effort deserves recognition. In a season that has quickly gone sour, Borchardt’s rise from former walk-on tryout success story into an indispensable rotation piece and now starting center has been a positive worth celebrating. I’m not really sure where the Huskers would be without him.